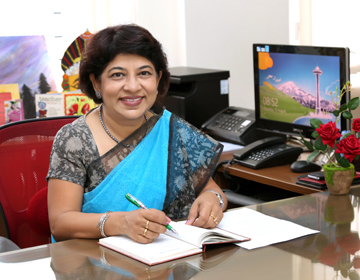 Ms. Alka Gupta, the Principal, is a beacon of excellence for she combines great leadership qualities with amazing interpersonal skills in her inspiring persona. As a long-term strategist, her vision and actions revolve around the upcoming institution and are directed towards infusing high standards of excellence in education. The focus of her approach is to achieve a higher benchmark in excellence in education by inculcating values and ethics in her team of dedicated faculty and zealous students. In the words of Martin Luther King Jr : "The function of education is to teach one to think intensively and to think critically". Building intelligence along with character is the goal of true Education. Develop a passion for learning. If you do, you will never cease to grow. At National Public School Yeshwanthpur, we aspire to empower the students to succeed in life through instilling in them the core value of self-discipline. A self-disciplined student easily masters self-control and sails through life, achieving higher goals. Our motto, 'Reach Out, Reach High, Reach Beyond' lies at the centre of everything we do at our institution. By laying special emphasis on academic excellence, life skills and extra-curricular activities, we provide our students holistic development with an edge over others and help them imbibe the art of enlightened leadership in their respective fields of activity. Parents, being the main stakeholders in the paradigm of educational relationships, are our vital support. The growing trust, goodwill and partnership with the parents through the last many years have made us justifiably proud of our contribution to the evolution of our students. We are powered by the singular aim and resolve to ensure that our students will grow to become enlightened and successful citizens of the world.